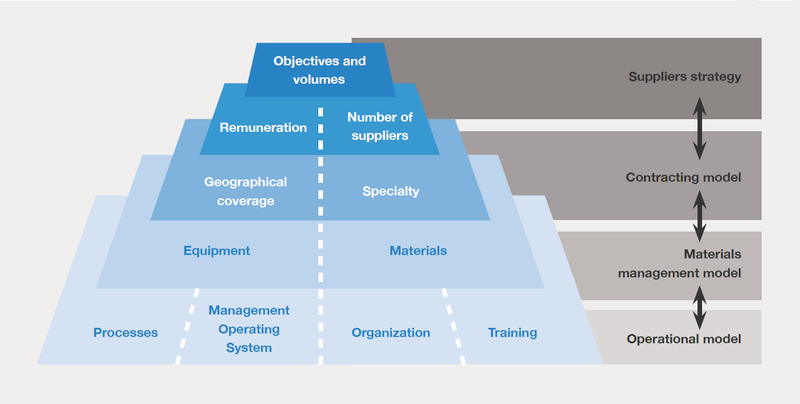 A well-balanced contractor operating model is key to significantly reducing costs and risks associated with outsourcing. The standard management model often leads to additional costs for both the contractor and the contracting company. 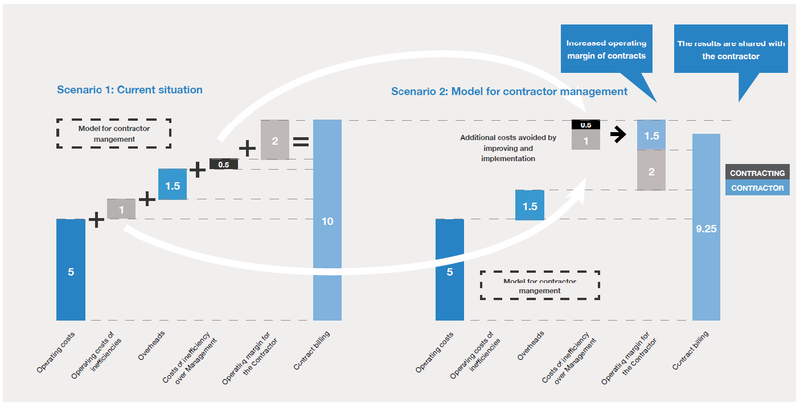 A common model, leading to a vicious cycle: there is a transfer of operational and management inefficiencies of the contractor, through the contract price. Contractors also lose in margin. On the contrary, aggressive price negotiations by the contracting company with the contractor could cause a reduction of the contract price, drastically reducing the margin of the contractor. Consequently, problems like the lack of commitment to plans and deadlines, quality problems and rework, increasing extra costs, penalties application, and what is even worse, lack of trust between contracting party and contractor undermining the relationship, will convert the model into something unsustainable. A healthy contractor’s management model is possible, based on mutual trust and commitment. And what it is more important: this model is built on a win-win collaboration base, increasing margins and reducing costs for each of the involved parties. 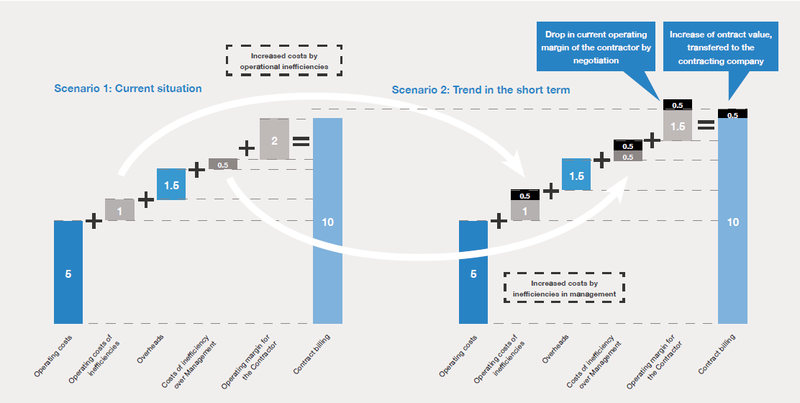 A win-win approach leading to an increased profitability of the contracts, which offsets the lower price. This pragmatic model provides a framework for finding a tailor-made solution for every possible situation, categorising and condensing most common problems into a reduced number of concepts. The steps for designing and implementing a win-win contractor’s management model vary from client to client, mainly depending on the starting situation of the client, and its level of evolution. But the two most logical approaches to start the journey of improvement are the bottom up approach (placing the basement at the operating level, and continuing building following layers on top) or the top down approach (deployment of the strategic definition of the model). The starting level will depend on the evolution the client has reached within the model. What kinds of situations can the management model address at each level? • At strategy level: decision-making criteria definition and process implementation to respond systematically the question of “do it internally or subcontract?”, according to an organizational capability evaluation. Once subcontracting is the decision, provide answers to questions like the adequate volume to be subcontracted, the targets to be achieved, the degree of dependence and commitment with selected contractors, how many subcontractors, among others. • Concerning the contracting level, respond to questions like what is the fair price for a subcontracted service; what factor(s) should be considered for the remuneration model; define the adequate number of suppliers, disaggregated by geographical area; if the activities should be done by generalist or specialist contractors; etc. • Management of Materials is key within the contractor’s management model. It answers questions like if the contractor will provide the materials or better synergies of purchasing can be achieved via consolidation; better equipment planning; etc. • Finally, at the operating level: design the operational model that proactively evaluates activity, productivity and quality levels, as well as cost optimization. In summary: this simple but powerful model can address the problems most commonly found in client-contractor relationships. It can also help to transform the current contractor relationship model into a differentiating competitive advantage. This post is a fragment of the white paper “Perspectives on Contractor Management” written by Alfa Consulting in collaboration with other members of the Cordence Worldwide Alliance.To view the entire white paper, click here to download the file.